Elaine has been complaining about how she hates Virginia Woolf. Her most recent assessment is that Virginia Woolf is like Twitter (or maybe sometimes like a blog) where you just get random unedited thoughts. Elaine is very harsh about how she really does not care about what happens to any of the characters in The Voyage Out, which she recently read for her book club. She was also pretty severe about what she would think if the person in the club who made the choice of the book did not herself read it. 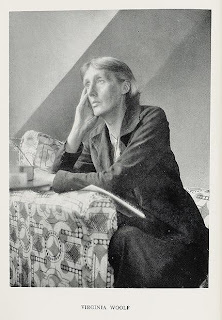 I've been reading a few Virginia Woolf novels recently, ever since I read the book about Virginia Woolf's domestic life. I do sometimes find it tedious, though I'm not that turned off. I was also interested in the VW chapter in Proust was a Neuroscientist. So I just started reading The Waves. And it really does read like Twitter -- at least the way I suspect Twitter reads. The whole first part is little short (surely less than 140 character) bits that seem to be random thoughts from some kids at school. "I see a ring," said Bernard, "hanging above me. It quivers and hangs in a loop of light." "I see a slab of pale yellow, said Susan, "spreading away until it meets a purple stripe." "The dining-room window is dark blue now," said Bernard, "and the air ripples above the chimneys." "A swallow is perched on the lightning-conductor," said Susan. "And Biddy has smacked down the bucket on the kitchen flags." After a while the tweets get a bit longer, but I don't know if I'm going to keep reading or join twitter. Thanks, Elaine.